Aviary Wonders Inc.: Spring Catalog and Insruction Manual by Kat Samworth. You don't hear that sound anymore, anywhere. Its 2031 and you are in the forest, yet there are no birds; they are goneÉÉÉÉ Extinct. 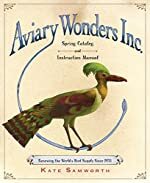 In the book Aviary Wonders Inc.: Spring Catalog and Instruction Manual by Kate Samworth you will learn how to make your own bird using extra special premium parts! If you are looking for a book about birds and what can happen in the future, this is definitely a book for you. Aviary Wonders explains what exactly can happen if we let the world's most amazing, precious creatures die out. This book focuses mostly on all the parts you can get and how exactly you are going to assemble your bird. You will be able to choose all the parts for your bird such as the beak, the wings, the tail, and even the body itself. It's like reading a 30-paged manual to bird building or watching a DIY video on Youtube. Aviary Wonders is great for any person with a big love for birds. Although it is quite sad because all birds are extinct, this is a lesson to anybody who litters, because what they are doing right now can impact all sorts of animals very badly and can lead to their extinction. Some of the vocabulary in this book may be a bit hard for smaller children, but this book is for everyone, no matter how young or old. That being said, this book is for anyone, but honestly recommend this book for kids anywhere from 9-12 years old. The information inside is just as amazing as the topic of the book, birds. Take a long and amusing adventure to the future and find out what can happen if we don't care for the beautiful animals of the Earth. You can get this book at a library near you, and when you do, enjoy every word of it. We would like to thank Houghton Mifflin for providing a copy of Aviary Wonders Inc.: Spring Catalog and Insruction Manual for this review. Have you read Aviary Wonders Inc.: Spring Catalog and Insruction Manual? How would you rate it?